Palmer Manufacturing & Supply and Viridis3D have announced a partnership to distribute and manufacture a complete Robotic 3D Printer System for all foundries in North and South America. Viridis3D has developed a Robotic 3D Printer that uses less material and is substantially less expensive that other 3D printers on the market today. "This printer currently has "patents pending" and is a game-changer in terms of producing only what you need – only when you need it," according to William Shambley, President of Viridis3D. "We are proud to have developed the first robotic sand based system to take a CAD file to print a mold and core and have a casting in literally a few hours," added Shambley. Foundries will appreciate both the speed with which the system prints molds and cores and how fast their operation can be up and running. Our software is so easy to use – you simply "press print." We have partnered with Palmer due to their expertise in providing heavy-duty peripherals to complete the system. Additionally, ABB, a world leader with international sales/service, is our robot partner. 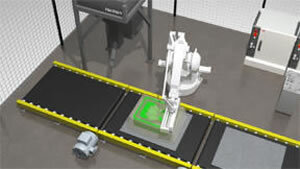 "Robotic 3D Printing truly defines lean manufacturing," said Jack Palmer, President of Palmer Manufacturing & Supply. This technology brings a new way of production – instead of shipping castings around the world; raw materials are shipped and files are simply transmitted to 3D printers in strategic locations. The result is castings are poured the same day, only where you need them. "This is a flexible and efficient production system unlike anything we have ever seen before – it is truly revolutionary. Palmer is pleased to bring the heavy-duty mixers, powder feeders, system controls, and other peripherals to this system," he added. Viridis3D & Palmer are accepting a limited number of foundries for beta sites. To be considered, please go to the application form.